The Greenschools’ Committee of Ballagh National School is very pleased to announce that we are busily working on our new theme of Biodiversity which is the fifth theme of the programme. As with the previous themes, you will see that Biodiversity cross-cuts and integrates with the rest of the themes in many ways. You may ask What is Biodiversity? The meaning of ‘Biodiversity’ is easy to understand when we break the word down; “bio” refers to life and ‘living things’ and “Diversity” means just that; range or variety. The word refers to the huge variety and variation of life that surrounds us on planet earth. Maintaining a high level of diversity among plants, animals and all living things all around us is essential in keeping the environment healthy and fit for human life. This includes diversity within species, between species and diversity of ecosystems. We interact with and have an impact on living things, directly and indirectly every day through our lifestyles; e.g. the food we eat or how we manage our gardens. So whether our school is based in a city or in the country like Ballagh the Biodiversity theme hopes to connect you, our school and our wider community with the natural environment and cultivate a sense of wonder, appreciation and value for all the biodiversity around us. The overall aim of the Biodiversity theme is for schools to increase awareness of the importance of biodiversity and for students and staff to come up with ways to help biodiversity. Species: A species is a group of organisms capable of interbreeding and producing fertile offspring. For example, the Mountain Ash is a species of tree, and the Red Squirrel is a species of mammal, the Chaffinch is a species of bird. Native Species: Our native species are the species of plants and animals that reached Ireland naturally; mostly since the last ice-age before Ireland was separated from the rest of Europe by the rising sea. As an example, the most common native trees in Ireland include oak, ash, hazel, birch, Scots pine, rowan and willow. Eventually, people brought other plants on their travels many years later. Native plant species are the preferred species for planting in school and home gardens. Non-Native, ‘Alien’ & Invasive Species: Alien species are also known as ‘non-native’ species. These are plants and animals that would not be found in Ireland without human involvement. Not all alien species in Ireland are able to survive and establish in the wild. Of those that do establish some can impact on our biodiversity and become invasive. The ability of a species to become invasive depends on a number of factors. These can include biological traits such as fast growth and reproduction. Invasive species often spread quickly or can move easily from place to place. Habitat: A habitat is the natural environment in which an organism lives, or the physical environment that surrounds, influences and is utilised by a species population. For example, a Red Squirrel lives in a Woodland habitat, and a Humpback Whale lives in a Marine habitat. Ecosystem: An Ecosystem is a community of plants, animals, fungi and micro-organisms that live, feed, reproduce and interact together in the same area or environment. Irish examples include a Bog, Woodland, a Marsh, a Hedge, a Lake, an Ocean or even a Rock Pool. You may also hear about Ecosystem Services. These are the benefits that ecosystems can provide to us, e.g. woodlands provide protection from flooding; forests can regulate climate change; reed-beds can break down wastes and recycle nutrients and can filter and purify water; animals and microbes working in soil maintain and increase soil fertility; plants purify the air; some animals and plants control pests and diseases and provide goods such as woods, textiles and food. Once we have measured what your school community know, and what species and habitats are present on your campus, we can start to think up ways to raise awareness about biodiversity, and also to encourage species-richness in and around our school. Once we have come up with these ideas and actions, we will write them down as an Action Plan (Step 3). Our action plan states what our targets are and how you are going to achieve them. It is important that we plan from the beginning how you will measure the success of your Biodiversity Action Plan. Monitoring and Evaluating (Step 4) improvements in your school will be done by repeating the Awareness Surveys. Ireland is home to about 815 flowering plants, about 80 native ferns, more than 700 mosses and liverworts, 3,500 fungi, over 1,000 lichens and 1,400 algae. There are 32 terrestrial mammals, ten bat species, two species of seals and about 24 whales and dolphins. About 425 species of birds have been recorded in Ireland, about half of these birds breed here. Many of these species are already under threat, some are even endangered. The freshwater pearl mussel, which lives in Irish rivers and is Ireland’s longest living animal, is facing extinction. If we want all of these species to survive, we must ensure that there are enough suitable areas for all to flourish. Ireland also has an extensive coastline rich in biodiversity and so we should not forget our surrounding seas. There is a huge array of life in our seas, most of which we may never see. Unfortunately, this too is being negatively affected in a variety of ways: overfishing, coastal activities and pollution are some examples, and so it is important that our marine habitats are also protected. The National Parks & Wildlife Service (NPWS) looks after the conservation of much of Ireland’s habitats and species. Ireland has six National Parks: Glenveagh, Co. Donegal, Ballycroy, Co. Mayo, Connemara, Co. Galway, the Burren, Co. Clare, the Wicklow Mts. and Killarney, Co. Kerry. Reductions in Ireland’s biodiversity will have serious economic and social consequences. In 2001, Ireland agreed along with other EU countries, to ‘halt the loss of biodiversity by 2010’. This has recently been extended to 2020. In order to achieve this we need to make a concerted effort at local and national level. Individuals, schools and communities can all play their part in halting this alarming loss of biodiversity. Ireland has come a long way in the past decade but we are still a long way off. Failure to protect our most endangered natural habitats and species will result in substantial fines for Ireland by the EU. We would like to credit the website https://greenschoolsireland.org/biodiveristy/ and Roscommon County Council Environmental Section and Heritage Section as they have informed us greatly about our topic. Recently the whole school worked with an excellent Heritage Expert called Martina Butler as part of our work on Biodiversity. This initiative was kindly funded by Roscommon County Council, this was much appreciated to assist and compliment the work taking place in the school already. We hope you all enjoy working with us to obtain our Fifth Green Flag. Ballagh Nature Detectives had the privilege of working with the Heritage Expert Martina Butler. This project integrated with our work for Maths Week / Greenschools/ Science/ Geography. The two day workshop were kindly funded by Roscommon County Council. Became aware of the importance of Biodiversity on Earth. Became aware of the Earth’s renewable and non-renewable resources. Recognise how the actions of people may have an impact on environments and its biodiversity. Understand what a habitat/ecosystem is by mapping their own school habitat. Recognise and investigate human activities which may have positive or adverse effects on local and wider environments. Come to appreciate the need to conserve the Earth’s resources. We used so many Skills: Questioning, observing, predicting, measuring, fieldwork. Look at our wonderful slideshow to see some of the biodiversity we surveyed and located in our school. “LEAVE THE CAR, COME WITH US. Weather permitting we hope to hold a WOW before or directly after the Midterm break from Niamh Hanley’s house..more information will issue via Text a Parent. 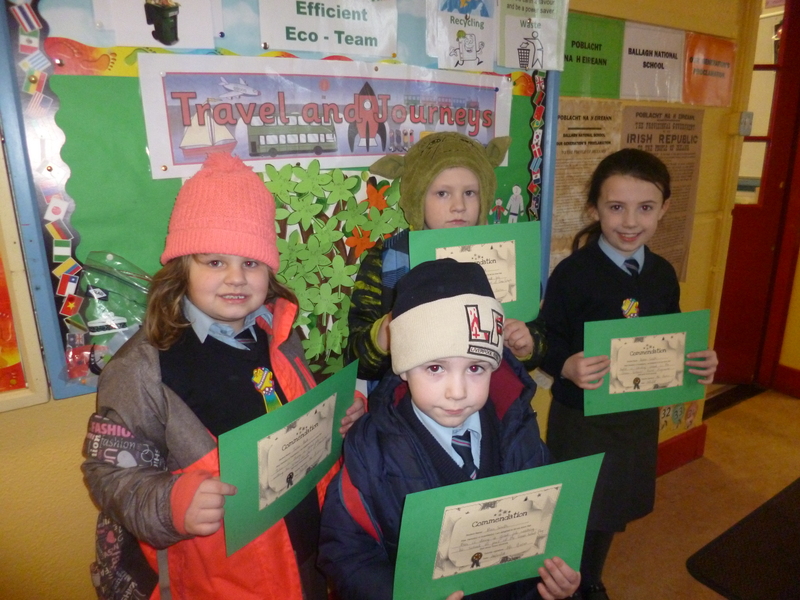 Come rain or shine the following pupils are making great “strides” to walk to school….well done to our Junior pupils for reducing their carbon footprint even in the most inclement weather conditions. that’s the Safe Cross Code!!!!! As many of us already know, cycling is a great form of exercise; an efficient form of travel; and a useful way to wake up and gear up for the day ahead. If you received a new bike for Christmas or have set a resolution to cycle to school this year, beginning to cycle for the first time can be a nervous yet exciting experience especially for Cycle on Wednesday Days! Some of you may have received new bicycles for Christmas but, new or used, always ensure your bike is in working order before beginning a journey. Check your brakes work, the tyres are the correct pressure, the chain is nicely greased and that your gears work – if you have them. Oh and don’t forget to bring your lock to keep your bike nice and safe at school. If you are new to cycling to school then you may want to think about, and plan, your journey. A useful way of getting familiar with your route and confident is to cycle with someone more experienced. Alternatively, you may want to cycle on a quieter day e.g. Saturday or Sunday. Cycle mindfully – by this I mean: be aware of your surroundings and never take for granted that people can see you or know what you are going to do and vice versa. Always cycle responsibly (respect the rules of the road) and safely. If you have to cycle on a footpath at any part of your journey to school remember you are the guest and always give priority to pedestrians. Cycle your way – be it cycling in your school uniform, cycling a racer to cycling a BMX, it is really important that you cycle your way and enjoy how you do. If you can’t cycle to school then don’t be disheartened, there are many ways to enjoy the bicycle e.g. socially with your friends; as a sport – join a club and or go mountain biking or on your school holidays. LEAVE THE CAR, COME WITH US. JUMP ABROAD THE WALKING BUS! Well done to all pupils who worked so hard on their travel slogans. This year we are working hard towards obtaining our fourth green flag. Our theme is based on Travel. We have worked hard in the past on the Green Schools themes of “Litter” and “Energy” “Water” and we continue to maintain these themes. We have a committee to represent all our hard work and to help think up ideas on how to travel to school in an eco-friendly manner. We monitor our modes of transport to school and we are currently working on the Environmental Review and Action plan for the Travel theme. We hope to hold some Action Days in the future and we have lots of exciting activities planned. We realise Climate Change is a serious issue that needs to be addressed by all nations. We are willing to make a contribution within our school and community. As part of our Curriculum and Greenschools work we have completed fieldwork with the help of Gillian Banahan and Caitriona our Green Schools Travel Coordinator. Recently, we went a wonderful walkability audit and SESE walk in the locality to assess where we might locate our park and stride location for our WALK ON WEDNESDAY initiative. Select a Green Schools Committee. This year we are working hard towards obtaining our third green flag. Our theme is based on Water. We have worked hard in the past on the Green Schools themes of “Litter” and “Energy” and we continue to maintain these themes. We have a committee to represent all our hard work and to help think up ideas on how to save water. We monitor our water meter at school regularly. We record the reading and make sure we have no leaks. We also carry out spot checks on taps and toilets every single day to make sure nobody is wasting water. Each committee member and our “Guzzler and Aqua Monitors” have special jobs on a daily/weekly basis. To check taps and make sure they are off and not dripping. Carry out spot checks on energy saving and appliances. Reading report actual readings to Miriam for our bills. Maintain recycling and compost bins. Inform other classes of our progress. Every year when we start our Green Schools project we pick a motto or Green Code.